In 2009 golf caddie Douglas Clement raised £100,000 funding to begin project to build distillery near St Andrews, followed in 2012 by a £670,000 Scottish Government grant. By 2013 the project still in need of funding, Clement sells the company to the Wemyss family in January, remaining as a director. Not bad going seemingly as the fundraising was not Doug’s own money, also the grant that appeared. Six months later work begins on the site, 2014 the distillery and visitors’ centre opens to the public on 1 December . Eden Mill is another local to St Andrews distillery opened these past years, at the estuary at Guardbridge, Fife. A long held dream to distil whisky in the East Neuk of Fife became reality today for the founders of Kingsbarns Distillery, their first expression: Kingsbarns ‘Dream to Dram’, crafted with barley harvested from the fields of East Fife. The result is a surprisingly a lowland style malt whisky. It’s nice to see Dream to Dram is packaged in pretty normal packaging, a nice change these days. The distillery began life as a semi-derelict farm steading – built around 1800 by Thomas Erskine, the ninth Earl of Kellie, as part of East Newhall Farm. The distillery has 4 wash backs and 2 stills (wash still 7.5k litres, spirit still 4.5k litres) using long lyne arms for maximum copper contact. And has a capacity of 34 barrels per week aiming for produce 200k litres of alcohol per year. Waste water goes through reed beds and is returned clean into the local burn; local farmers use waste as fertilizer as per usual, and spent grain is used as cattle feed on neighbouring farms, again as per standard. The dram/bottle is certainly not cheap, almost £45 for a very young first dram, and unlike a neighbour Daft Mill, released the whisky as soon as possible, maybe they should have left it a wee while longer (like daft Mill). Distiller Peter Holroyd has been at the helm of distillation from the very beginning, turning his passion for whisky into a reality with the Wemyss family. A native of Glasgow, Peter graduated from the Heriot Watt Brewing and Distilling Course in Edinburgh, working in a number of small breweries before joining the Kingsbarns, this is his first whisky appointment and he has a young team with him. Wemyss is owned by the Wemyss family. Their family seat is Wemyss Castle in Fife where they’ve lived since the 1300s. Wemyss Malts is primarily known for its range of blended malt Scotch Whisky which uses names inspired by the natural flavours and aromas of the whiskies: The Hive, Spice King and Peat Chimney. www.wemyssmalts.com. What I do find strange for a distillery is this offer; £10 instead of £20 for a tour for two or £18 instead of £40 for four of Kingsbarns Distillery and Visitor Centre; includes 2 drams each – save up to 55% with itison. Their statement also confused me; become a whisky expert with a tour of Kingsbarns Distillery and Visitor Centre. 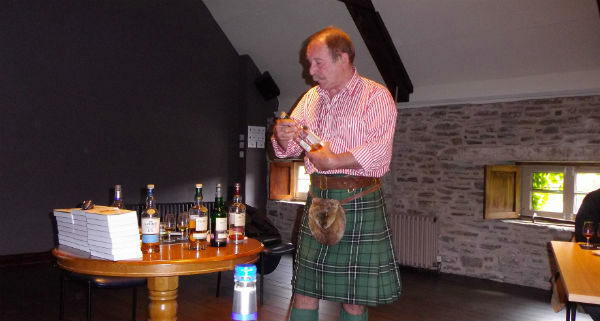 How can a person become an expert in whisky after an hour or so at a distillery and 2 drams? You kick off your visit in the exhibition, where you can discover the history behind the distillery and local area. You then step in to the 18th century doocot, where the first cask of Kingsbarns spirit is resting and test your sense of smell by identifying common whisky aromas even before the distillery walk about by the way. Your guide will talk you through the ins and outs of distillation before you head to the tasting room to sample two drams but when we took the tour, the drams couldnee be actual distillery drams as the three years and a day had not been reached.